Wanna get high in Mostar? How about, like, 23 metres high? Then join us on the last Sunday of every July for the Old Bridge diving competition in Mostar, the town in Bosnia-Herzegovina where Soonfeed was born. We’ll be posting LIVE on Facebook so you can be there when it happens, no matter where in the world you are. Like a ballerina. My first jump didn’t hurt at all. I might be an Australian living in Brussels, but Mostar is my spiritual home. Spiritual because I want to throw up in my mouth a little whenever I’m there. Not always in a bad way though. In 1986 I crossed the Old Bridge for the first time while visiting the old country with my then-Yugoslav father. In 1993 I watched, from a cosy couch in Melbourne, as the bridge was obliterated by war. By 2002 I got weary of the cosy couch and migrated to Mostar as an OSCE press officer. It was in 2004 that I spotted, from my flat above a gyno clinic near the bridge, a washing machine floating down the Neretva River. This was a few weeks before the official opening of the reconstructed Old Bridge, and Prince Charles was going to be there for God’s sake. So I enlisted volunteers to remove 7 trucks of rubbish from the river. We never found the washing machine. 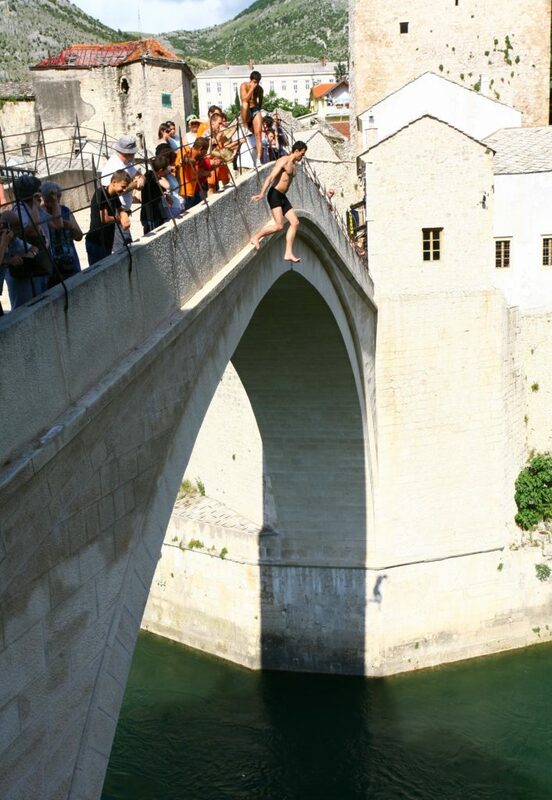 In 2007 I returned to Mostar, this time to jump from the bridge for the first time. It didn’t hurt at all. The following year I jumped from the bridge again. That time it hurt a bit. But we set a world record for the most people chanting the word “subsidiarity”. My second jump hurt a bit though. Richard Medic is founder of happeningo communicators and Soonfeed, a beforetime media mission to tell the truth early and often.